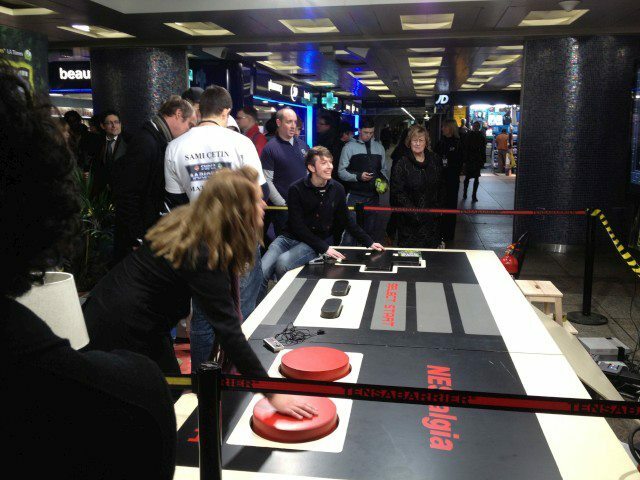 The Guinness World Record for the largest videogame controller on the planet has been broken! 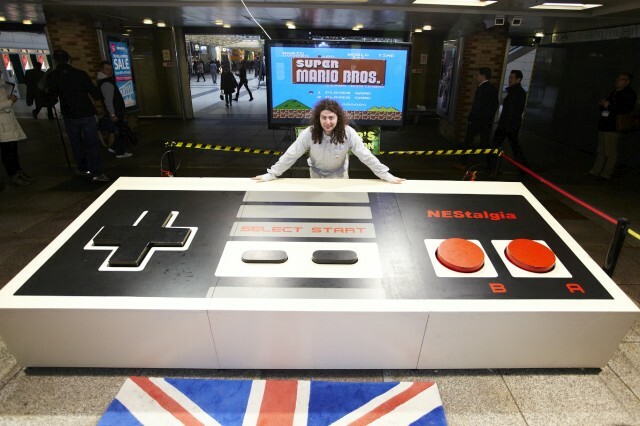 British electrical engineering student Ben Allen along with co-creators Stephen van ‘t Hof and Michel Verhulst put together a gigantic 12ft x 5ft 3 in x 1ft 8 in, 18 stone NES controller to take the title, a joypad so big it needs two people to operate! “The idea basically came from a brainstorm,” said Allen. Showcasing the achievement at London’s Liverpool Street Station, Tech Digest and Shiny Shiny got some hands-on time with the daddy of all retro controllers. Though it takes some getting used to, the oversize buttons responded really well, pushing back against our hands with a satisfyingly spongy feel. Together we managed a respectable 67 lines on the NES version of Tetris, a potential record in itself on the unique controller. The event was held in order to promote the release of the Guinness World Records Gamer’s Edition 2012, which also features other quirky gaming records like “Longest Gaming Session in Free-Fall” and “Largest Competitive Pokémon Videogame Family”. We can’t begin to imagine what the conversation around that family dinner table must be like! “We’ve been burning the midnight oil like ninjas for the 2012 Gamer’s Edition: witnessing record attempts, talking to developers and playing as many videogames as we could handle.” said Guinness World Records Gaming Editor, Gaz Deaves. Out on Thursday 19th January, the Guinness World Records Gamer’s Edition 2012 will be available from all good bookstores. And some rubbish ones too! This existence book full to capacity with all the amazing proceedings,facts and feats that they encompass a right to look forward to mothers day messages from GuinnessWorld proceedings. it be axed on or after the post for a quantity of motive. Agreed, How cool is this thing, right? I’m very jealous you got a hands-on opportunity. We also had to include this in our post showcasing the top 6 sights of CES 2012.